Posted January 27th, 2019 by Mike Boyes & filed under Early Social and Emotional development, Interpersonal Attraction Close Relationships, Social Cognition, Social Psychology, Social Psychology, Stress Coping - Health, Stress: Coping Reducing, The Self. Source: Why People Ghost – and How to get Over It: Time to go ghostbusting, Adam Popescu, Smarter Living, The New York Times. So how does Psychology seem to be doing in trying to get our heads around what ghosting is and how to deal with it? 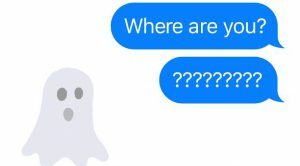 It is clear that ghosting is tied into relationships and into how people cope with either side on ended relationships (the same way that people had to cope when “Dad” went out for some smokes and never returned). What is perhaps different about ghosting today is how it is played out through texting and other forms of communication media. Just as Facebook’s use of the term “Friends” to describe the entire array of people one is connected to through that social media platform is drawing us to ask if this represents a sort of concept creep or if we should avoid applying much of what we know (Psychologically) about the nature of friendship to those sorts of connections. Figuring out what is the same as before (ghosting = dumping and ignoring) and what is different (end of relationship expectations in the age of social media and electronic connectedness) are interesting and important research tasks as we all try and figure out how these things work these days both personally, relationally and psychologically. What aspects of human relationship dynamics and outcomes does ghosting match up with and what does ghosting add into our considerations of relationships that was not here previously? Is thinking about and deciding what, if anything, needs to be done about concept creep (e.g., Friends before and after Facebook)?